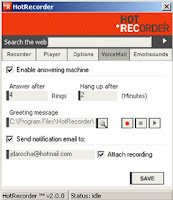 HotRecorder for VOIP is an advanced tool that lets you to easily record, play, store and convert voice communications held over the Internet. 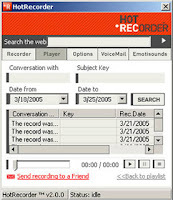 HotRecorder records all parties in 2 different channels and merges them into a single file. It uses a new technology that encodes the file so you may store, share, and even search recordings in your playlist. # Works with Skype 3.0™, Google Talk™, AIM ™, Net2Phone™, Yahoo! Messenger ™, FireFly™ and many other VoIP applications. # Useful voicemail for Google Talk™ and Skype™. # Audio Converter Tool: convert the proprietary ELP format into MP3, WAV or OGGfiles. # Emotisounds ™ to add humorous sounds to your online conversations! # File, play and share your conversations!